We've all thought about public speaking anxiety as we've faced up to an important conference speech. And, some time back we also detailed a few tips to help you overcome your fear of public speaking. But once you have your anxiety sorted, then you need to focus on how you can be an enthusiastic public speaker. Because public speaking with enthusiasm is a skill that you should certainly aim to develop. 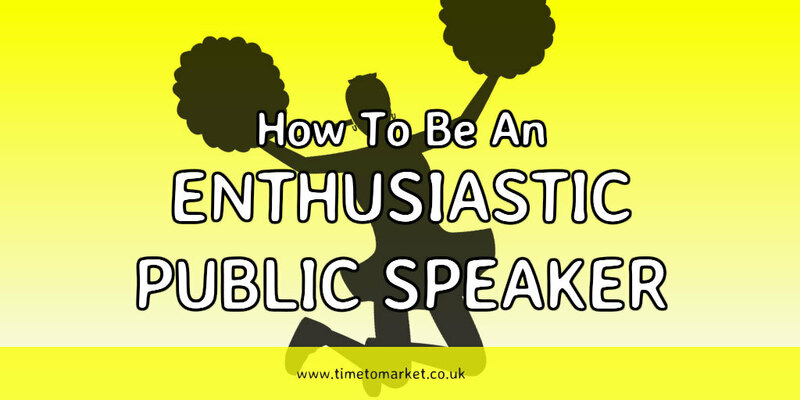 So what's going to encourage you to become an enthusiastic public speaker? Well, it's likely to be the prospect of success. And the TED talks are a good place to start when we think about success. These talks are successful not least because of their enthusiastic speakers. These are speakers who command your attention because of their sheer enthusiasm for their own subject. Their talks simply brim with enthusiasm. And, of course, it's immediately obvious to their audience. Just take a look at Jamie Oliver’s TED 2010 presentation and then consider his obvious enthusiasm for the subject. You can't help but become involved. Or, there's Geoffrex Cox QC, the Attorney General. His speech at the Conservatives 2018 conference in Birmingham certainly got the audience energised before Theresa May's speech. You really can't doubt his enthusiasm for his subject in this short 12 minute speech. Do Enthusiastic Public Speakers Give Great Speeches? So, the big question. Do enthusiastic speakers give great speeches? Well, looking at the causes and the effects, then we think ​so. Because enthusiastic speakers really do give good speeches. Keeping things really simple, we reckon there are 3 reasons why this can work for you. You can always reflect your enthusiasm as a public speaker in your voice. So, your words become lively and energetic. And certainly you'll find that your audiences will appreciate that. As you speak, so your all-important pace and modulation are affected by your enthusiasm. Sometimes fast and sometimes slow. But you are never boringly plodding. Just think of the polar opposite. It's that speaker who has no enthusiasm, a regular flat delivery spoken in the same monotone. Now, that's sleep-inducing. When you are enthusiastic then you are typically relaxed, at peace with yourself. Your very movement on the stage suggests enthusiasm. And your audience knows that you are enthusiastic. Because they can see it as well as hear it. Of course, that's important because they use two of their senses to support their finding. So, a relaxed speaker is usually a confident speaker. And confident speakers speak successfully. So, love your subject and appreciate the opportunity that you have. And then, go that bit further. Really respect your audience and help them to learn more about the subject that you love so much. Because it goes without saying that a truly successful speaker is also an enthusiastic public speaker. And you too can be an enthusiastic public speaker. You can uncover a whole series of tips for public speakers with our regular posts, podcasts and videos about public speaking. And when you want to give your public speaking skills a further boost, then why not consider some training? Because a well-timed training intervention can be just the tonic you need to become an enthusiastic public speaker. Please don't hesitate to get in touch when the time is right. Please don't hesitate to get in touch for public speaking course advice. "Enthusiasm is not contrary to reason. It is reason—on fire."